Originally three large groups of Indians settled the jungles of Central America. On the peninsula of Nicoya in Costa Rica there have been found proofs of human colonization that seem to originate from around 9000 years anno domini. Not only mature spread out over the continent, but also different Indian people of the two eight different Indian tribes became indigenous in Costa Rica. The Guaymies, an Indian tribe, who has been living in Panama and Costa Rica for thousands of years, didn't communicate in a written form. Instead of writing down the life and experience of the ancestors in history books, they passed their myths by verbal means from generation to generation. The recent history of the Guaymies was strongly affected by the development of the Transamerica road in the year 1964. Thanks to this road many white settlers entered the areas that were inhabited by the Guaymies. They chased the Guaymies away from the fertile valleys into the mountains. Due to the fact that the Guaymies didn’t consider the country as a possession but as a borrowed good from God, they left their country without resistance. Therefore they didn't fight for their land and continued to move out. In 1977 a national commission finally put four areas for the Guaymies under legal protection. These days, about 4500 Guaymies are still living in these areas. 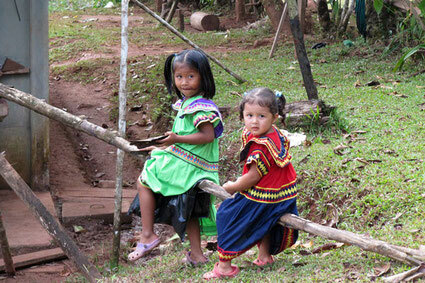 Today the Guaymies language is taught at their schools, in written and oral form. The women and girls are still proudly wearing the typical clothes of the Guaymies, which they sew themselves in laborious manual work. Today there are 22 Indian reserves of different tribes in Costa Rica. The reserves are very remote and rarely attainable by car. Most of these areas are situated in the primeval forest and the procurement of food is difficult. This is also the case in our reservation on the peninsula of Osa. Around 150 indians live at the reservation «Alto Laguna».